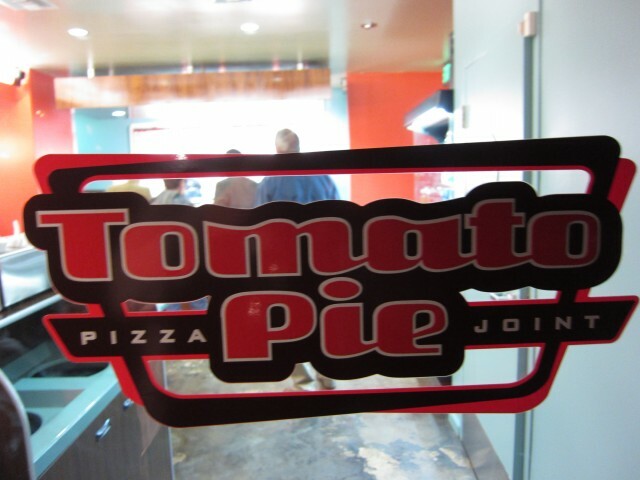 Tomato Pie, a pizza joint in Hollywood and Silverlake derives its name from, well, tomato pie. Tomato pie is a Sicillian’s take on pizza where the dough is fococia like and thick. 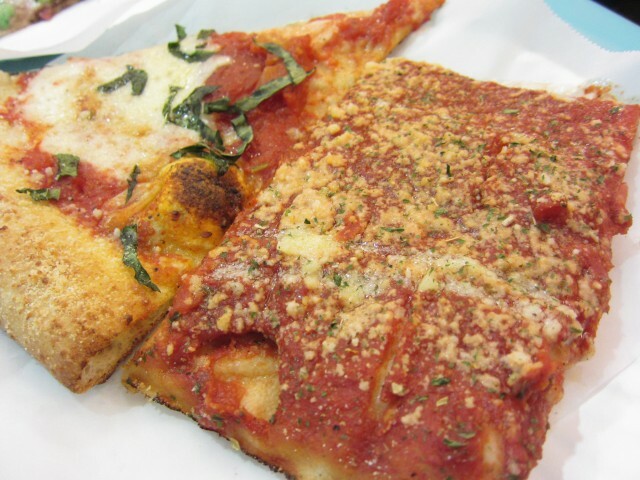 It is normally topped with tomato sauce and sprinkled with cheese. Never having tried tomoato pie, Tomato Pie was an obvious choice. The color scheme inside was refreshing and fun. Entering, it seemed more relaxed than I thought. You order the pizza or slices you want, they prepare it, and you pick it up. They come in the flappy paper plates you get at Costoco, but the choices of pizza they offer is amazing. And of course the taste is great as well. Honestly, I did not like the tomato pie, but I do like Tomatoe Pie. The tomato pie was the first thing I ate, as I was excited to try it. Topped with marinara sauce, herb, and pecorinno romano cheese, it felt a bit lacking in flavor. The marinara sauce was better than most, but the lack of meat and melted cheese was too missed. 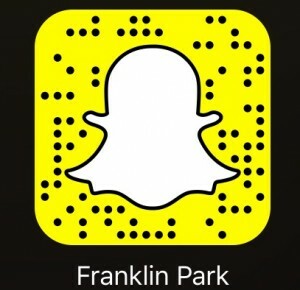 Sad to say, maybe the simplicity of it all didn’t do it for me. The Grandma had crushed marinated tomatoes, basil, garlic, and light mozzarella. Though simple like the tomato pie, I really liked this one. Their pizza, the triangle sliced kind, has a crust so crispy and cracker like. The robust flavors of the basil and garlic were perfect with the light mozzarella melted on top. The Prosciutto Happiness, probably my favorite of the three was an obivous one — Prosciutto is the magic word. Having alfredo instead of marinara, it was a bit rich in taste. 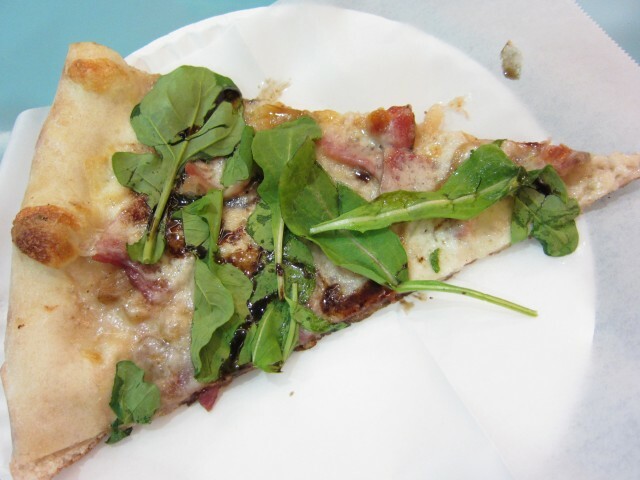 The fig, prosciutto, arugula, topped with a balsamic reduction was all a great combination. Prosciutto and fig is always a nice combination of sweet and salty, and the balsamic reduction gave it that nice punch. The crispy crust and thin pizza made it easy to fold and eat. Eating tomato pie for the first time was exciting, but didn’t really enjoy it. They offer a variety of different kinds of pizza, but the Gramdma and the Prosciutto Happiness is a nice starting point. Not exactly made to order, but prepared to order, everything still comes out warm and toasty. 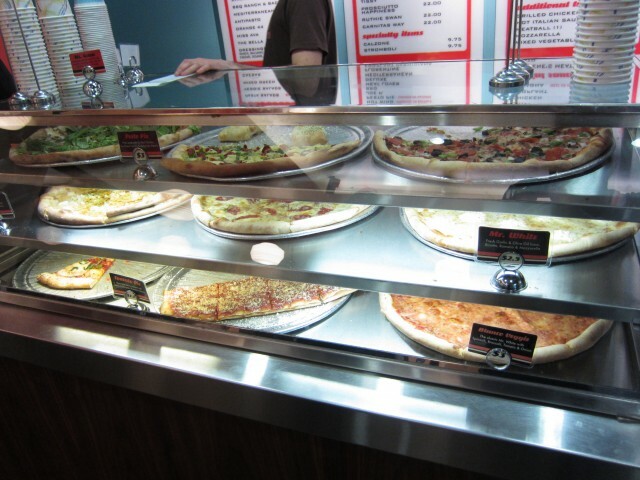 With a refreshing Light Coke and endless pizza options, Tomato Pie delivers, figuratively and literally.